Personally, I hate having a dedicated administrative account, different from the one I normally use to log on to my laptop, read my email, write code and perform all the tasks that do not involve administering a server. A dedicated account means another password to remember, renew periodically and reset whenever I insist typing it wrong (happens quite frequently). I hate it, but I know I cannot avoid having it. Each user should be granted just the bare minimum privileges he needs, without creating dangerous overlaps, which end up avoiding small annoyances at the price of huge security breaches. When I was working as a developer only, I was used to having my windows account registered as sysadmin on my dev box and, when I switched to a full time DBA role, it took me a while to understand how important it was to have a different sysadmin user for the production servers. That said, one of the things that makes the use of dedicated administrative accounts awkward and frustrating is windows authentication in SSMS. While extremely handy when the user that has to log on to the database is the same logged on to windows, integrated security becomes pesky and uncomfortable when the database user is a different one. SSMS must be opened choosing “Run as…” from the context menu. It’s the most common way to run a program as a different user, but I would happily live without this additional step. The user’s credentials have to be typed in. OK, seems trivial, but I find it annoying. Typically, users with elevated privileges are subject to more stringent password policies, that means longer passwords, no dictionary words, symbols. Having to type such a password once a day is enough for me. This limit is imposed by windows, that filters the messages between processes in different security contexts. It’s like russian roulette. Want to play? Settings are stored separately. Each modification to program settings has to be made on both profiles. 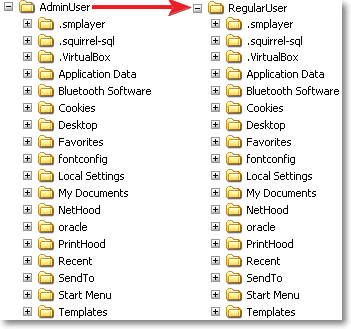 Application settings are stored somewhere under the user profile folder, or in the registry. 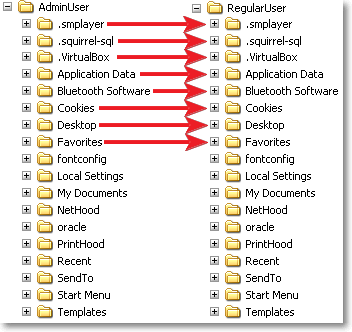 In both cases, each user has different settings, stored in different locations. By default, SSMS points to the user’s documents folder. How to overcome these annoyances? A simple solution comes from a small tool released from Sysinternals in January 2010. 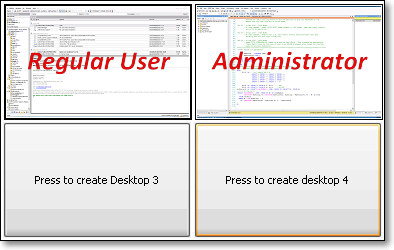 Unlike other virtual desktop utilities that implement their desktops by showing the windows that are active on a desktop and hiding the rest, Sysinternals Desktops uses a Windows desktop object for each desktop. Application windows are bound to a desktop object when they are created, so Windows maintains the connection between windows and desktops and knows which ones to show when you switch a desktop. In other words, Desktops is able to create a whole desktop process and then run new windows bound to that process. This also means that the main desktop process (explorer.exe) can be started in a different security context, simply terminating and restarting it. All the windows started from that moment on will be bound to their originating desktop process, hence to the same security context. Done! 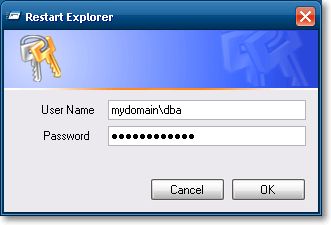 A new explorer process will be started with the credentials you supplied. By default, windows restarts automatically explorer whenever it is killed, making our efforts in vain. In order to work around these problems, I coded a small C# application called RestartExplorer that identifies the explorer process bound to the current desktop and restarts it as a different user. The code is straightforward and you will find it attached to this post. For those not so comfortable with Visual Studio, I also attached a compiled version. By clicking OK, the explorer process gets terminated and immediately restarted under the specified security context. This creates a brand new desktop process, entirely dedicated to our administrative account. 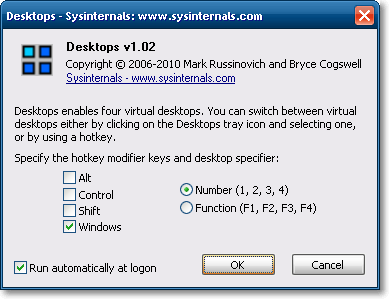 To switch back to the regular users’ desktop, you just have to press the hotkey combination you set up in Desktops’ control panel or click on the tray icon, thus implementing something very similar to windows’ “quick user switch”, but quicker and more versatile. We still have to find a way to share application settings between different windows accounts. We spent hours and hours configuring SSMS with our favourite keyboard settings, templates and all the other things that make our lives easier: we don’t want to set up everything from scratch for our administrator user. Is there a way to share the same settings we set up for the regular user? Of course there is, and, again, it comes from Sysinternals and it is named Junction. 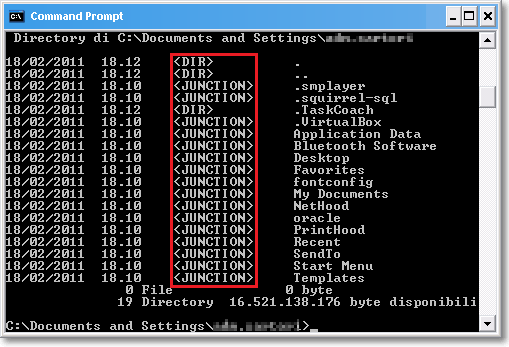 Junction is a tool that allows creating symbolic links on the NTFS file system. The concept of symbolic links has been present for many years in UNIX operating systems: symlinks are anchors to files or folders residing on different paths in the file system, that are treated as if they were physical files or folders in the path they are linked in. Unfortunately, the profile folder contains a special file, named NTUSER.dat (the user’s registry keys), that cannot be opened concurrently on a desktop operating system. WARNING!! Symbolic links act exactly as normal folders: this means that deleting a folder that is instead a symbolic link, will delete the link’s target folder. In other words, deleting a file from AdminUser’s profile folder, will delete the file from RegularUser’s profile! Be careful! Settings are saved in the same path. Every change in the program settings will be automatically saved in the original profile. Open and save dialogs point to the same documents folder. However, registry settings will not be shared. There is a tool (RegLN) that allows creating symbolic links in the registry, but, personally, I don’t feel like exploring this possibility, that I find a bit dangerous. In the end, SSMS settings are saved in the profile folder, which we already have shared. This is enough for me. Posted on March 10, 2011, in SQL Server and tagged Security, SSMS, Windows. Bookmark the permalink. 3 Comments. I’m not so sure about the Russian Roulette thing with multiple SSMS windows. It seems to me that SSMS opens a double-clicked file to the SSMS window you last had opened or clicked in. I’m working on SQL 2k5 and that’s what it does to me, anyhow. Thank you for the tip, Brandie. I have always suspected it was like that, but it happened to me sometimes that the wrong SSMS received the file. Having a separate desktop for my sysadmin user helps a lot.